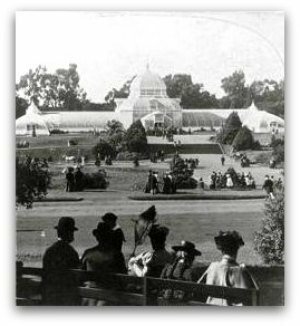 The San Francisco Conservatory of Flowers is a survivor from another era, when ladies and gentlemen took tea in the conservatory (hopefully without Colonel Mustard) and admired exotic plant specimens collected from around the world. In spite of a history of disasters, the Hall of Flowers is still with us and graces Golden Gate Park with its wedding-cake facade. Inside this Victorian confection is a lush world of orchids, primeval ferns and carnivorous plants. 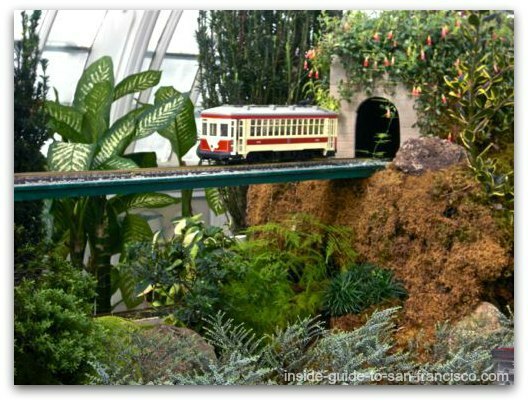 And to top it off, the Conservatory of Flowers usually has some cool special exhibits, some of which involve miniature train sets with original themes. Admission is free the first Tuesday of each month. Something new: the Conservatory now has docent tours. Hear about the Conservatory and its plants on their one hour tour. They even hand out plants and cutting to guests. 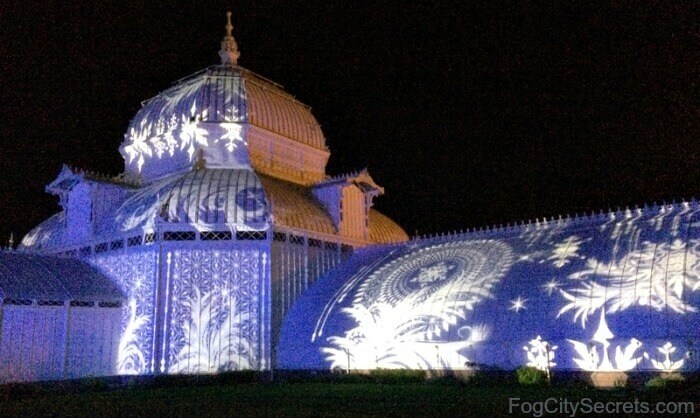 The Conservatory has started a program to light up the surface of the building in fantastic forms, geared towards special events. It all started with the Summer of Love (the 50th anniversary in 2017), with the facade covered with psychedelic visions. And starting December 7, 2017, the Conservatory created a flowery wonderland on its surface, with a series of swirling designs to represent fall, winter and spring. Runs through spring, 2018, from sundown until 11:45 pm every night. Very pretty! Good job; what's next? 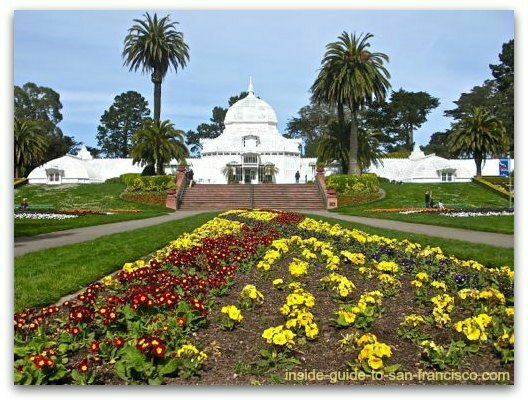 The San Francisco Conservatory of Flowers is the oldest wood and glass conservatory in North America. It was built in 1878-79, at a time when the Victorians were wild about exploring exotic lands and discovering strange new plants. Every grand house had its conservatory to display its plant collection, and the passion for orchids became extreme. Orchid hunting occasionally took on ruthless aspect in the competition for the rarest specimens. 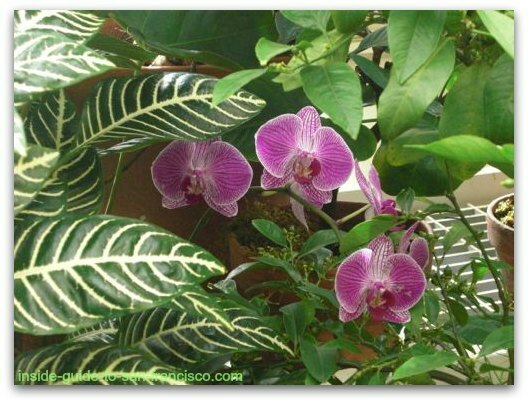 So naturally, the Conservatory provides visitors with a great orchid experience. The central area and dome were destroyed by fire in 1883 when the boiler exploded. More fires related to the boiler plagued the building, and it was closed from 1933 to 1946 because of structural problems. The ferocious windstorm of 1997 caused extensive damage to the fragile wood and glass Conservatory. 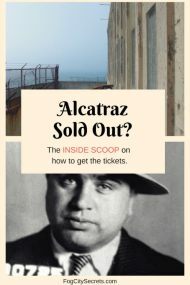 Broken glass and structural damage sidelined this popular San Francisco attraction until it reopened in 2003. Fortunately, no problems since then! Entry into this green world takes you through a series of rooms that recreate different ecosystems representing a variety of jungly environments: lowland tropics, highland tropics, aquatic plants and a potted plants gallery. As soon as you come into this gallery, you know you're in a steamy, tropical jungle. You may have to take off your jacket. Water drips off the lush green ferns and in the back is the towering, 150-year-old philodendron. 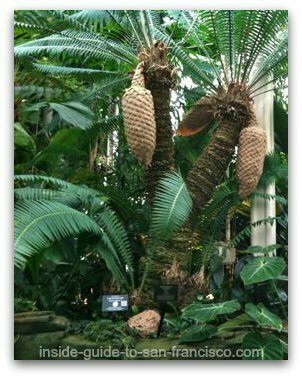 Plants older than the dinosaurs, like the Cycad fern below, with its huge, hanging pods, recreate the primeval environment of 170 million years ago. This gallery also contains a number of food-related plants; you can get a chance to see what coffee, cacao, cinnamon, cardamom, allspice and banana plants look like. The highland gallery is refreshingly cool after the hot lowland milieu. This area houses a collection of plants that live on the misty mountaintops of tropical regions around the world. A large variety of beautiful orchids cling to the tree trunks, or are presented in special cases. Orchids do particularly well in these cool, damp regions, and the Conservatory has a large collection of them. 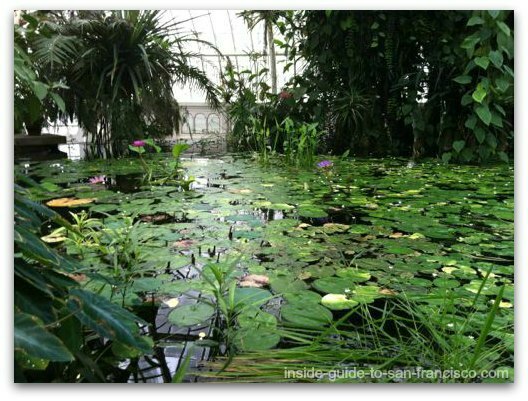 The San Francisco Conservatory of Flowers has one of only four tropical highland displays in the U.S. 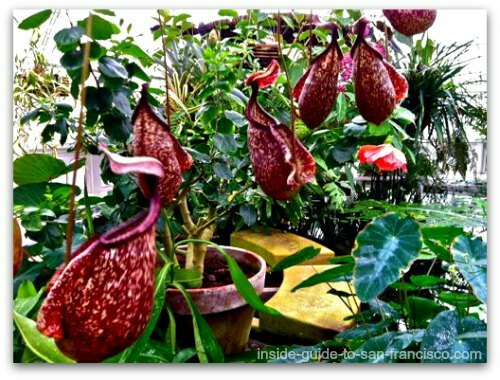 This is a delightful gallery with its spreading lily ponds and hibiscus flowers; watch for the clusters of carnivorous pitcher plants, patiently waiting for a bug to slip and fall in. The Victoria amazonium makes its home here: its gigantic lily pads can be six feet across and support the weight of a child. Sometimes you come across the unexpected amidst the rocks and tree fronds! The Victorians were big on potted plants; the gallery here presents seasonal displays in its collection of pots from Burkina Faso, Indonesia, India and other parts of the world. Winter poinsettias, Chinese New Year kumquat and orange trees, and summer begonias are set out in season. 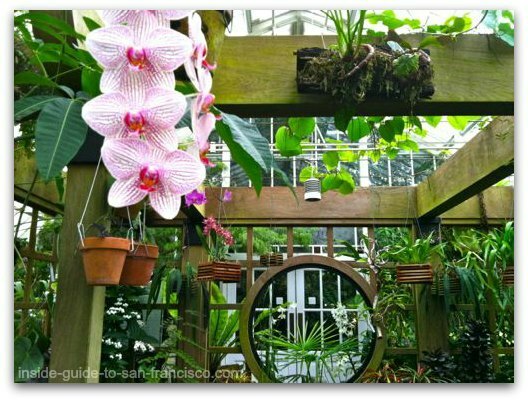 The wood-framed arbor, Asian-inspired, with climbing orchids, is also in this gallery. Vanilla comes from an orchid (who knew? 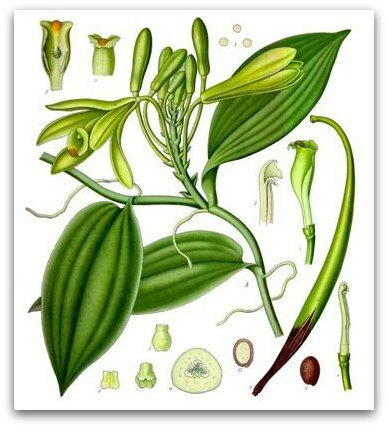 ), Vanilla planifolia, that grows in the hot, lowland jungles of Central America and the West Indies, and is raised commercially in Mexico and Madagascar. The conservatory has a vanilla orchid in the Potted Plants Gallery, near the entrance to the special exhibit. The vanilla flower lasts only one day and can pollinate itself, though it happens so rarely in the wild that cultivated vanilla plants are pollinated by hand. 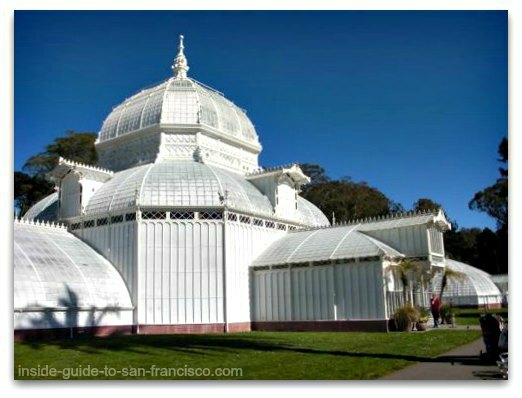 Usually twice a year, the San Francisco Conservatory of Flowers puts on a special exhibit in the room at the far left of the building. They're quite creative; one year they had dinosaur models lurking in vegetation consistent with their geological periods, with a T-Rex poking his head out of the top of the building. One of the exhibits every year generally involves an elaborate model train set-up, a big hit with the kids, and fun for older train-fans, too. Surrounded by lots of plants, of course. 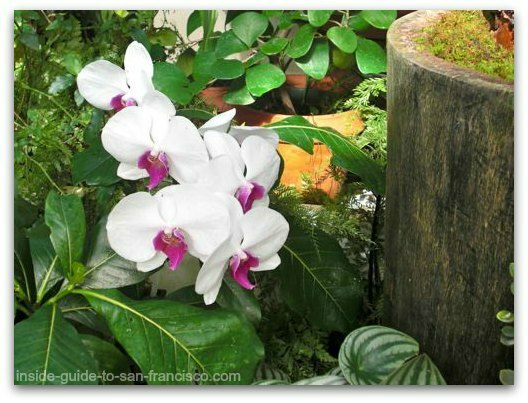 You can check their website for the scheduled exhibits: SF Conservatory of Flowers. 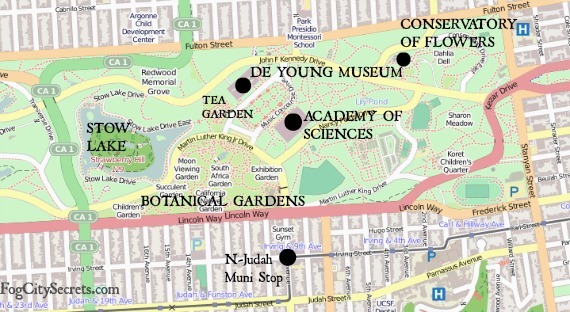 The Conservatory of Flowers is in the eastern end of Golden Gate Park, on JFK Drive, just down the road from the de Young Museum (about a 15 minute walk). The 5-Fulton bus will bring you reasonably close. Get off as close to Arguello at Fulton as you can; Arguello runs right into the park and past the Conservatory. Or take the N-Judah street car and get off at 9th and Irving (a longer walk). 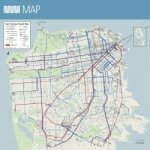 You can catch either one on Market Street downtown (Muni is underground there). Except on busy weekends and holidays (and Sundays, when JFK Drive is closed to cars in that area), you should be able to find parking along JFK Drive, not too far from the Conservatory. If parking looks dismal, you can look for a space further west on JFK Drive near Stow Lake, about a 30 minute walk. I wouldn't try the street parking outside the park on busy days unless you have a parking angel. 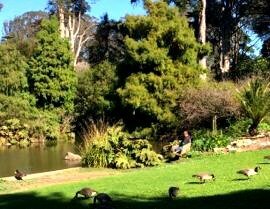 Find out all there is to do and see in Golden Gate Park: museums, lakes, windmills, bike rentals, and more. More flowers? The Botanical Garden (Arboretum) is close by, with 55 acres of beautiful plantings. 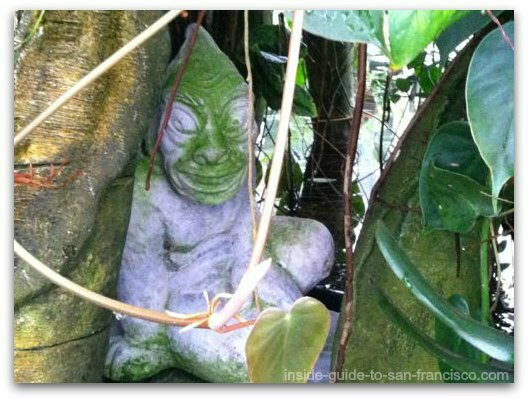 Golden Gate Park has all sorts of specialty gardens tucked here and there: the Rose Garden, Fuchsia Dell, Shakespeare Garden, Fern Grotto and more. 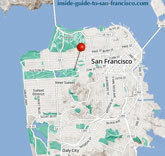 See the Gardens of Golden Gate Park, with photos and a map of their locations.